This article will give you a step-by-step guide on how to rip the newly released DVDs on Mac for playing on Apple TV 3. With the coming of 2014, new DVD releases never take a breather, and even the shortest month of the year will have plenty of popular or critically acclaimed movies that screened in theaters last year hit the retail market. Dallas Buyers Club, Free Birds, Game of Thrones are all the popular DVD movies. Have you had owned some or will you plan to borrow them form Netflix? Have been bored to play on your Mac and want to play on your Apple TV 3 for a good enjoyment? Want to look for a easy-operated software to help you finish the conversion? Just read on and this article will solve all of your problems. 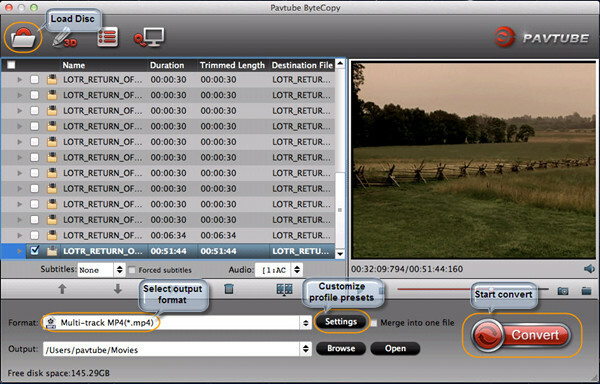 Working as a Swiss army knife in DVD ripping field, Pavtube ByteCopy for Mac removes the copy protection from your DVD and convert to just about any video format. It offers a wealth of tweaking options to get the best possible file as a result, and even has pre-configured profiles built in that make things easier for you to rip DVDs in the right format for various of portable media devices like Apple TV 3, iPad Air, Samsung, Google, Asus, Amazon, etc. If you’re on a PC and want to get DVD to play on Apple TV, please refer to ByteCopy to handle the task. Now, I will show you exactly how to get the DVD into format you want for Apple TV 3. It is the fast and easy way even for a first time DVD ripping with basic knowledge of computer. Step 1: Load DVD movies. Insert your DVD; launch this DVD to Apple TV 3 converter. Then head to “Load File” icon to import the DVD file. This program will start scanning titles in DVD. After the files imported, you’ll see the interface looks something like screenshot below. All of the major functions are shown in front of you, including the options to check DVD property, choose output format, edit the files, and preview the movie and several other options. Step 2: Choose Apple TV 3 format. Click the “Format” bar and Choose “Apple TV 3 1080P Dolby Digital Pass-through (*.m4v)” under “Apple TV” profile. Note: A Blu-ray often has multiple tracks and subtitles, also want to keep the multi-track? 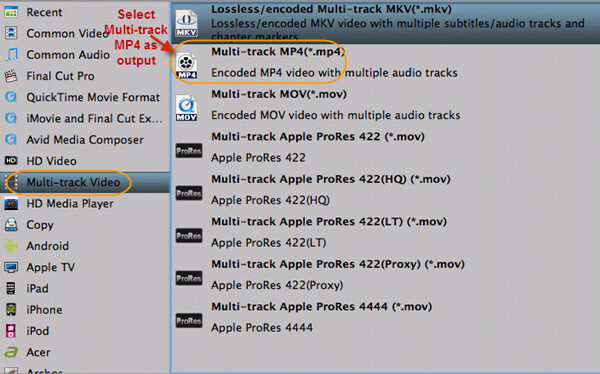 Press on the “Format” bar, choose “Multi-track Video > Multi-track MP4 (*.mp4)”. Then, you might tweak the output parameter settings to get better video/audio quality before the Mac DVD to Apple TV 3 process. For the most part you can leave this alone; the default optimized settings should be fine as is. Please keep in mind, the bit rate setting for any Apple devices can’t be up to 160kps. Now you can go ahead and rip that DVD. Simply hit the “Convert” button at the lower right corner of the window to begin ripping DVD movie to Apple TV 3 format. This will take a while, depends on the encoding settings, hardware of your Mac computer and the length of the DVD file. After the conversion completed successfully, drop the file into iTunes’ left sidebar, then sync your Apple TV 3. Apple TV 4 vs Roku 4: Which box will hold your attention?